Philly’s Santucci’s Pizza is our latest favorite neighborhood spot. When I lived in RI I would often meet friends at Pizzeria Regina in Boston for an incredible pizza and a long wait in the crisp winter air. Since moving to Philly I haven’t quite found a pizza place that is as good, and I’m still on the hunt. The best I’ve found so far is at Santucci’s Square Pizza. Since having Raffi, PB and I look for more casual, laid back restaurants where patrons wouldn’t be too offended by a stroller and a minute or two of tears now and again. We enjoy dining out and don’t want to lose that just because we have a baby. We were strolling through Philadelphia’s Italian market one weekend when we walked by Santucci’s. I quickly headed to Yelp and saw the reviews were good so we decided to stop for lunch. Santucci’s is a classic pizza place. It is small and casual with no decor to really speak of. It feels like home in a way, like the type of place you’d want to return to time and time again. The food is great, and the prices are reasonable. I had a cheese pizza and a Caesar salad. The pizza is famously square with the sauce on top of the cheese. The crust was the extreme opposite of salty and had the perfect ratio of crunch vs. chew. The pizza is hard to describe in flavor, but I will sum it all up by saying that you can taste that the ingredients are fresh. I love that. PB had spaghetti and meatballs. While it was tasty, it was definitely not as delicious as my pizza. Since that first encounter we’ve now gotten takeout pizzas a few times from there. We recently found out they deliver to our new home (we close Thursday and move in 10 days!!!!) so I know we will be indulging in their pizzas even more often. We are still on the hunt for a pizza place that rivals Pizzeria Regina, but for now, Santucci’s is the winner. I’ve never seen a pizza like that. Lots of sauce on top. I live in Boston and I agree, it is tough to find better than Regina’s. There is a reason the line is always out to the street. I don’t live in Philly, nor do I have plans to visit in the near future, but that Pizza looks amazing! I love extra sauce on pizza, so sauce on top looks right up my alley. I don’t know of any places out west that put sauce on top. santucci’s is a northeast philly staple! i was surprised to see them expanding into hipster south philly this summer. their pizza does rock. i last indulged after the ’11 philly half marathon. charlie’s pizza on the boulevard near oxford circle is, imho, the best in philly. perfectly hand stretched crust baked to a crispy but not thin crust perfection. tangy but not tart homemade sauce, and big browned blobs of extra mozz (high quality) on top like little islands of paradise in a sea of red gravy. yummm… ok, my study halls students are probably wondering why teacher is drooling. @jen, Don’t laugh at me, but what is the boulevard? Or where, rather?? @RhodeyGirlTests, Roosevelt Blvd. It’s the road we take to church! @jen, Also, I would definitely NOT describe Santucci’s like that. Therefore, I MUST try Charlie’s! That looks great! I enjoy Stella Pizzeria in Old City- mostly because I like thin woodfired pizza. It’s a little pricey but the restaurant is family friendly and the food is always good. @Jamie @ FoodinRealLife, I love Stella too, but sometimes I want a more classic (reasonable) pizza. I can’t wait to go there this summer when the weather is nice and we can sit outside! I grew up on Santucci’s pizza!! 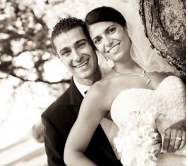 A native of NE Philly Santucci is a household name! Definitely one of my favorites! square pizza looks yummy! you gotta get your lil fam to tacconelli’s. it’s a short drive, but totally worth the excursion…plus it’s byob/s(salad)/d(dessert). @Krista (kristastes), I’d love to go there, but isn’t the wait always totally ridiculous and you have to reserve your dough? Or is that someplace else? Let’s meet there for dinner one night! Looks amazing! Sounds good to me! And no, we haven’t been to Slice yet but I’ve walked by! @Melissa Paretchan, I’m so silly. I didn’t realize that. It’s Roosevelt Blvd? This is the 4th time THIS WEEK that someone has recommended Santuccis! I consider myself a pizza fanatic and now I must try this! It’s also really close to my house! Im not sure where your new house is but do you know if they deliver to the west side of Broad? Good sicilian pizza. I’m not as crazy about slice, I like a doughier crust, but it’s worth trying. I think I could write a blog about pizza, I love it that much!! @Becky, They said they deliver “up to Market”. Not sure if that encompasses where you live? I’m horrible with maps and directions. I have never even heard of FrancoLuigis. I’ll have to try it – thanks for the tip. What do you think of Tacconellis? We had Santuccis for dinner last night, I work quick! Definitely two thumbs up. And they delivered! (we’re in South Philly, but on the West side of Broad). I’m obsessed with the crust. Best. EVER. I did think it was a little pricey though, we got a large to share with friends and it was only big enough for everyone to have 2 slices (which was fine for me, but not for the dudes.) but I’ll definitely order again! Sadly, I have not been to Tacconelli’s (maybe tonight? haha!). But I think its weird and a little ridiculous that you have to reserve dough. Seriously? You’re a pizza joint! Make more! Also, there is a new pizza place on Passyunk Ave called Birra which rivals Stella and is DEFINITELY worth a trip to South Philly. My family LOVES Santuccis! If your willing to make the drive over the bridge you got to try Tacconelli’s in New Jersey. I am not kidding you the drive is completely worth it and its a friendly casual family atmosphere. The salads are delicious and the pizza is like nothing I have ever had before. Heres the info! Always go to santarpio’s in east Boston have been going since I was a kid, there’s always a line and it’s soo good. Will have to try reginas never been. @Jen, I’ve never been there, but I PROMISE that if you check out Regina’s you will not be disappointed. I’m pretty sure my dad has talked about that place before! Mike and I will have to check it out with the baby next time we are in town. Like you, we still love going out to eat a lot even though we have the baby. We got ballsy and took her to Yang Ming when she was 3 months old :/ She was a good girl though and she wasn’t the only baby there! I was a little scared! That pizza looks amazing! You’re lucky your little guy’s belly lets you eat it. I breastfeed my 5 month old and anything tomato is off limits which is so painful for someone who LOVES italian food! I haven’t tried tomatoes in a month or two so it may be time to test it out again. But as you know I’m sure, nothing is worth a fussy baby, not even amazing pizza! When I first saw the picture, I thought you had a bunch of Rhode Island pizza strips! Too funny. It sounds like it was delicious pizza though. @MelissaNibbles, Imagine a warm pizza strip with cheese underneath. DELICIOUS. By the way, they call pizza strips tomato pie here. Gross, right? Ooh! Santucci’s is GREAT! 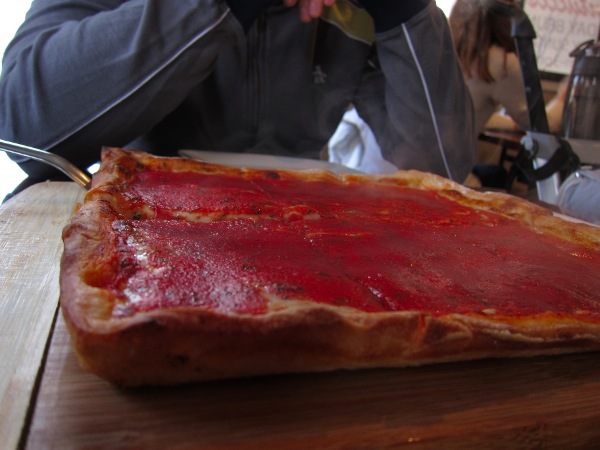 Have you tried SoHo pizza in Old City? I really miss that place since moving to NYC. The Margarita is lovely. 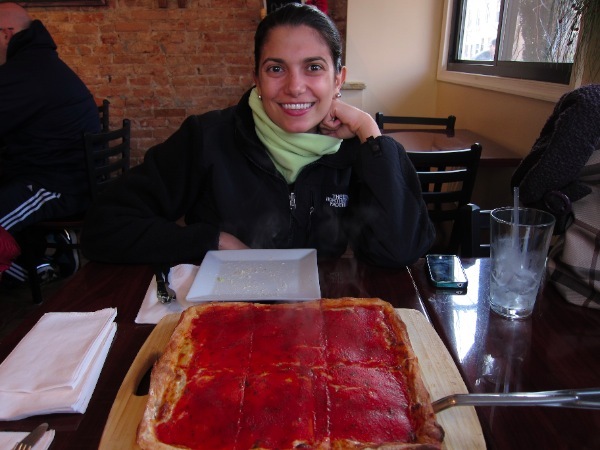 I’m a South Philly girl…my husband is from Boston…and when I went to Pizza Regina for the first time many, many moons ago, I was hooked. Every visit back includes a visit and now we have our boys hooked on it too. My husband is also on the lookout for something in Philly to live up to the high Regina standard, but we haven’t been successful. We will have to try Santucci’s. And do tell if you ever find anything better! You should try Alex’s pizza, too! It’s really good on Leverington in Roxborough. Super yum, as well! Roosevelt Boulevard, Rhodey Girl – it’s the road we take to church every week!